In limit of trigonometric ratios we will learn how to find the limits to the values of sin θ, csc θ, cos θ, sec θ, tan θ and cot θ. According to the definitions of the trigonometrical ratios of a positive acute angle are always positive. Remember that the trigonometrical ratios may be positive as well as negative. 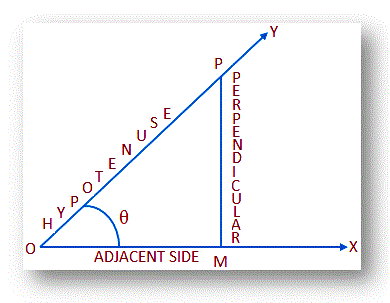 From the above picture, OP is the hypotenuse of the triangle POM; hence, PM ≮ OP and OM ≮ OP. Therefore, from (A) we get the values of sin θ and cos θ cannot be greater than 1. Therefore, it is clearly seen that the values of csc θ and sec θ can never be less than 1. In this case, the values of PM may be greater or less or equal to the values of OM. Thus, the values of tan θ or cot θ may have any non-negative value. (iii) The values of tan θ and cot θ can have any value.